As you've probably heard by now, Mitt Romney made some disparaging remarks about the estimated 47% of the US that do not pay federal income taxes. A natural question for us Canadians is to wonder how many non-payers there are in Canada. Glen McGregor suggests that the comparable figure for Canada is 34%, but unfortunately, he is comparing apples to oranges. So here's a more accurate answer. The 47% (actually 46.4%) might refer to the proportion of estimated total tax units in the US that had no federal tax liability in 2011, according to a model by the Urban-Brookings Tax Policy Center. Or it might refer to the estimated 45.9% of estimated total tax units in the US that had no federal tax liability in 2010, according to actual IRS data for filers and estimates of non-filers. The 34% refers to the proportion of tax filers in Canada that had no federal or provincial tax liability in 2009, according to actual CRA data. Obviously, the year used in the computations and the data sources are different. But those are not the main problems here. One issue that will always arise when comparing the US and Canadian income tax systems is that most married couples file a single return in the US. This is why US data refers to "tax units" rather than individuals. But this, too, isn't the main problem, since it's unclear how this distinction skews figures. A major issue that is easily fixed is that the 34% refers to Canadian filers that did not pay federal or provincial income taxes. But, as it turns out, over a million Canadians that paid provincial income tax in 2009 did not pay federal income tax. The US statistic refers only to federal income tax, so a more comparable figure would be the 38.2% of Canadian filers that paid no net federal tax in 2009. Another major issue is that the 38.2% refers to the proportion of Canadian filers, while the 47% in the US includes non-filers. The proportion of American filers that didn't pay federal income tax in 2010 was 40.9%. Now, filing requirements are different in the two countries, so even comparing filers with filers is not a fair comparison. Unfortunately, I can't find an estimate for the adult population in Canada at year-end 2009, but the estimates for the 15+ and 20+ population in mid-2009 and mid-2010 are readily available from Statistics Canada. From those, we can estimate that the adult population was roughly 27.0 million at the end of 2009, which means that the proportion of the Canadian adult population that did not pay federal income tax in 2009 was about 41%. Looking at 33.9% and 46.4% might drive us to think that, proportionately, much fewer Canadians than Americans escape the federal income tax. But when you realize that the comparison should be between 41% and 46%, the two countries look much closer. In actuality, the gap is probably even smaller. In the US, the child tax credit gets directly subtracted off your income taxes. By contrast, in Canada, the child tax benefit (as well as the GST/HST credit) is provided throughout the year. So a family that owes $400 and gets $1,000 in child benefits would count as non-paying in the US, while it would count as paying in Canada. A slightly greater proportion of Québec filers paid federal income tax in 2009 than Ontario or BC filers! At the end of 2010, I posted about the 2012 presidential race. As it turns out, that post has held up quite well over time: the 9 states that I held up then as "Tossups" are pretty much the states to watch now. The one addition to make is Wisconsin, due to Paul Ryan's presence on the ticket. Those 10 states are exactly the top 10 likely "tipping point" states today as identified by the FiveThirtyEight blog. To be sure, the outcome in some of the other states isn't set in stone. But if Obama wins North Carolina, or if Romney wins Oregon, then the election isn't even close. So the above 10 states are pretty much the only useful ones to look at in order to see who is likely to win. Currently, Obama leads in all ten of these states, though his advantage is often tenuous. Not surprisingly, PA, MN and WI, the three states carried by both Gore and Kerry, are the strongest for Obama, who has a lead in the mid-to-high single digits. In the seven other states, Obama's lead is in the low single digits. Option 1 still leaves Romney in a tough spot, as he'd need to win all of CO, IA and NV. Option 2 still leaves him at a disadvantage, as he'd still need to win 3 of the 4 small states (but now NH can be one of them). Option 3 is the only one that gives Romney the upper hand, as Obama would then need to run the table on the smaller states. Obviously, the Liberals did much better than expected, with a "ballot box bonus" of 4-5%. Some commentators have said that this usually happens in Québec elections. While this may have been true historically, it wasn't in 2007, when the ADQ got the bounce, and in 2008, when the PQ got the bounce. So I don't think that this bounce could have been predicted based on past experience alone. Rather, it is more likely that many Quebecers intending to vote Liberals felt somewhat ashamed, and didn't want to admit it to pollsters: they felt that they had to vote for a party perceived as corrupt because the other options were so unappetizing. I had predicted that the PQ would come close to sweeping this region, which is what happened. The Liberals did better than expected here, at the expense of the CAQ. I had thought that the CAQ would win at least 12 seats in this area, but it only got 9. No big surprises in these regions: the Mauricie and the Estrie were predicted to be tight, Central Québec was predicted to go for the CAQ, and the Liberals were expected to win a majority of the Outaouais seats, with a good chance of a sweep. Still, the Liberals came in at the higher end of the expected range, as it beat the PQ in the Mauricie and the Estrie, and swept the Outaouais. Again, no big surprises, but the Liberals performed at the higher end of expectations everywhere (except Laurentides-Lanaudière, where their only shot was Argenteuil): they kept all their Montréal seats, retained a majority in hard-fought Laval, and saved as many Montérégie seats at they could. The CAQ, on the other hand, performed at the low end of expectations, losing most races to the PQ. The Liberals won almost every seat where they were in contention, particularly in races against the PQ. Indeed, the Liberals lost only one race to the PQ by less than 3.5% (Saint-François), but won in six ridings with less than 3.5% over the PQ (Richmond, Verdun, Trois-Rivières, Papineau, Maskinongé, Jean-Lesage). The clear winner is Too Close To Call, while 308 fares a little better than RxR. All three models overestimate the CAQ. This is probably because they use the ADQ as the CAQ's baseline, but in reality, the CAQ's support isn't as efficiently distributed as the ADQ's was. A crude way to transform these into a single sensible projection would be to average them, and bring QS up to 2 seats to the detriment of the PQ. This would have given: PQ 53.5, LIB 45, CAQ 24.5, QS 2. TCTC fares a little better, so it provides some real value added. On the other hand, unfortunately, 308 and RxR fare worse, so at least for this election, those models weren't very useful, although those websites remain excellent resources for maps (RxR), graphics (308) and analysis (both). 8:30pm: Liberals surprisingly strong for now, and in the lead! Very early though, and probably mainly early votes being counted. 8:59pm: PQ government declared by Radio-Canada. Not sure if it'll be a minority or majority. It could be a long night, as many thought. The surprise is that the Liberals are, for now, above 30%. They are holding up particularly well in Quebec City, which hurts the CAQ, which sits at 18 seats despite actually getting the expected vote count (27-28%). The Liberals are also holding up in the Eastern Townships (except in Charest's Sherbrooke seat! ), which is what separates the PQ from a majority. 9:15pm: Things have stabilized. The PQ is a few seats from a majority, but very close if you add in the two QS seats. The Eastern Townships are really what makes the difference right now. 9:43pm: Numbers have moved very little. It now looks quite unlikely that the PQ will win an outright majority. However, PQ+QS could get 63 seats, though they're quite not there now. 10:01pm: Radio-Canada declares that the next PQ government will be a minority. This is, of course, not a surprise, since everyone acknowledged it as a likely (even though not necessarily the most likely) outcome. The surprise, however, is that it's the Liberals, rather than the CAQ, that stood in the way of the PQ: right now, the PQ only leads the popular vote by 2%. Note that the Liberals are exactly at the very high end of my admittedly wide ranges, both for the seat count and for the popular vote. They won more seats than when they formed government in 2007! As for the act of terrorism, well, Québec politics are not dull. It will be interesting to see the fallout... Update: Apparently, it was even more serious than first thought. Let's hope that every Quebecer and every Canadian, from hard-core separatist organizations to compulsive Québec bashers, react to this in a responsible way. 1. Forum also polled 8/27-28, and had numbers very close to those of Léger and CROP. So there may indeed have been movement from the CAQ and QS to the PQ. 2. 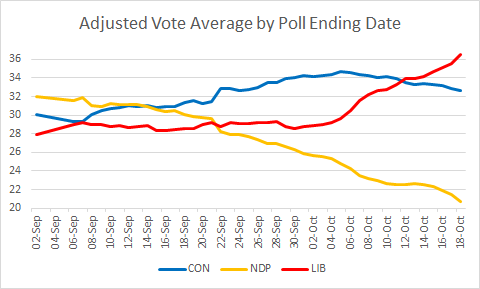 Polling during Labour Day weekend can be good because it's closer to Election Day. It can also be bad because the sample may be different. This puts the movement posited in point 1 in doubt. 3. Forum also had a weird poll after the first debate showing the Liberals at 35%, completely out of whack with everything else we've seen. 4. In the 2008 election, the Québec firms (CROP and Léger) had the PQ at 29% and 32%. Then Angus Reid, who had been quiet all campaign, swooped in showing the PQ at 36%. The PQ finished with 35.15%. Moreover, in the 2007 election, the Québec firms had the ADQ at 25% and 26%. Then Angus Reid, who had been quiet all campaign, swooped in showing the ADQ at 30%. The ADQ finished with 30.84%. 5. The ADQ, the CAQ's predecessor, beat the average of the last CROP, Léger and Angus Reid by 3.8% in 2007 and 2% in 2008. 6. EKOS usually overestimates the Greens federally. The same may happen with QS. 7. I am not aware of any track record for EKOS and Forum in Québec provincial elections. Will they play the role of Angus Reid? Or will they miss badly, being newcomers to the Québec provincial scene? - a Liberal win, since the PQ and the CAQ likely won't both be low, as they fight each other in many ridings. These could only happen in a "perfect storm" of sorts, where all three parties end up with 30-31%. Interestingly, the Liberals' only faint hope at finishing first involves the CAQ doing well, since this would hurt the PQ much more than the Liberals. However, since the beginning of the campaign, the CAQ and the Liberals have not combined for over 60% in any poll (if I remember correctly), so this is very unlikely. In fact, the scenarios that I find plausible as to the ranking of parties and majority/minority remain the same as last week. However, the latest two polls showing the PQ at 36% have reduced the chance of a CAQ win, and increased the chance of a PQ majority. I'd say that there's a ~60% chance of a PQ majority, a 30-35% chance of a PQ minority, and a 5-10% chance of a CAQ minority. Whatever happens, it'll be a fascinating election night tomorrow. Have fun! Furthermore, a fourth projection website, RidingByRiding, was brought to my attention. 1. I moved my own analysis to another post. 2. 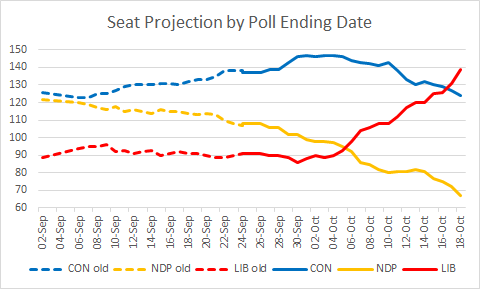 I added numbers from RidingByRiding, which take all four most recent polls (Forum, EKOS, Léger and CROP) into account. 3. The numbers from Too Close To Call have been updated to take the Forum (but not EKOS) numbers into account. 4. The other two websites have not yet updated for either the latest Forum or the latest EKOS. All four websites call for a thin PQ majority. We note that 308 has different popular vote estimates because it adds an adjustment favouring the PQ and the Liberals at the expense of the CAQ. We also see that the TCTC model to transform popular vote into seats is kinder to the PQ than the 308 model (more seats with lower popular vote), but not as kind as the ElectionsQC model (fewer seats with higher popular vote). RidingByRiding gets results close to ElectionsQC, but probably uses a higher popular vote for the PQ because it includes the Forum poll. Although I'm out of the projections game this time around, I've still played around the the numbers a little. I believe that the ElectionsQC model is too optimistic for the PQ: if the PQ gets 69 seats, which is certainly possible especially given the latest polls, it would likely need more than 32.7%. I also disagree with the 308 popular vote adjustment (although if 308 doesn't update for the latest Forum poll, which goes in the same direction, then the adjustment effectively averages that poll in). It could end up being right, but I would not use it as a "best guess", especially since the CAQ's predecessor (ADQ) outperformed the last CROP and Léger polls by 5-6% in 2007, an election with somewhat similar dynamics. Therefore, of these models, I personally prefer the TCTC and the RxR ones. The difference between their projections can be attributed to the inclusion of the EKOS numbers by RxR, but not by TCTC. However, there is so much uncertainty this time around that I would urge you to be even more cautious than usual when interpreting these models. Also, Forum Research's most recent poll (I don't know if it was their last one) had PQ 33%, Lib 28%, CAQ 27%. Obviously, the three pollsters are in agreement about the overall numbers. But there is much uncertainty about what seat distribution would arise. The best guess, should the PQ win by about 5%, with the two other parties roughly tied, is that the PQ will be very close to the majority cutoff (63 seats), one way or the other, while the Liberals would form the Official Opposition. However, given that the CAQ is a new party and that the election is being fought on a new electoral map, the projections this time around are less reliable than usual. 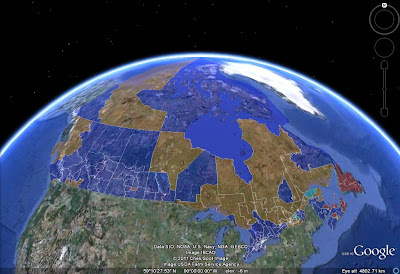 For example, with actual vote shares, the 2011 federal election would have been pretty easy to get right outside of Québec. But this time, even if we could see the overall vote shares in advance, the predicted seat counts would be subject to significant uncertainty. Add to that notoriously fickle Québec voters - the last CROP and Léger in 2007 had the ADQ at 25-26%, when it actually got 30.8% - and the truth is that we can't even be sure that the PQ is going to win. What we do know is that certain regions are much more unpredictable than others: about 2/3 of the seats in the "450" (Laval, Laurentians, Lanaudière and Montérégie) seats are closely contested, while only 1/4 of the races in Montreal, Quebec City area, Central Quebec and far away regions are tight. Here's a quick overview of the electoral geography for this election. The PQ should win at least 13 of the 17 seats, and could sweep all 17. The CAQ should win at least 14 of the 21 seats, and the PQ should win two (Pauline Marois in Charlevoix and downtown Quebec City). It'll be interesting to see if Option Nationale leader Jean-Martin Aussant can be elected in Nicolet-Bécancour. The remaining are essentially Liberal-CAQ races, and it would not be surprising for the Liberals to be wiped out even though they won a majority of this region's seats in 2008. The Liberals won all 5 seats in 2008 (though the previous version of Johnson, won by the PQ, included part of the region), but none of them, including Jean Charest's Sherbrooke seat, is assured this time. It's an all out fight between the Liberals and the PQ in every seat. Hard to tell what'll happen here, as all three parties have a shot at winning seats. The Liberals have swept this region in every election since 1981, but this time, the PQ could win in Hull and especially Papineau. The Liberals' only shot is in Argenteuil, which they won in 2008, but lost by 3% in a June by-election. Otherwise, this area could well determine whether the PQ wins a majority or a minority: there are a handful of safe PQ seats, but most of the other ridings feature tight PQ-CAQ races. CAQ leader François Legault, as well as star candidates Jacques Duchesnau and Gaétan Barrette, are all running here, and none is assured of winning. The Liberals swept Laval in 2008, but this time, they are only assured of retaining Chomedey. All five other seats will be tight, though student leader Léo Bureau-Blouin has a good chance of winning Laval-des-Rapides for the PQ. The CAQ could be a factor, but the main contenders are the Liberals and the PQ. Apart from their two strongholds of Vaudreuil and La Pinière (Brossard), the Liberals have no safe seats, and are only competitive in a handful of other ridings near the western half of the Island of Montreal. The PQ has several safe ridings near the eastern half of the Island of Montreal. The rest of the region (about half of the 23 seats) will feature right PQ-CAQ races, much like in Laurentides-Lanaudière. There are 6 tight races in Montreal: not much, but more than usual. Anjou, Laurier-Dorion, Verdun and Saint-Henri--Sainte-Anne will be tight between the Liberals and the PQ, while Gouin (Françoise David's riding) and Sainte-Marie--Saint-Jacques are fought between the PQ and QS. The remaining 22 ridings will likely divide as follows: 16 Liberals, 5 PQ and 1 QS. The CAQ is not a factor here.